Play this highly addicting physics based puzzle. Find a way for the bomb to reach the monster so you can blow it up! Place the fan according to where you want the wind will blow that will carry the bomb towards the monsters. 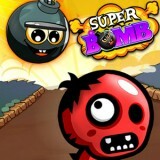 Increase your bomb speed and collect all the stars to get a better score.